(Nanowerk Spotlight) Turning atmospheric carbon dioxide (CO2) into valuable products seems like a great idea to help remove this greenhouse gas to mitigate climate change. 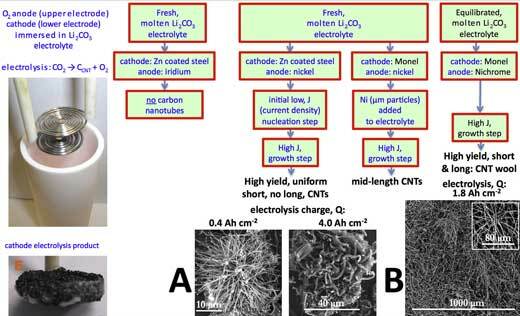 In 2015, we reported on a high yield, low energy electrolytic splitting of CO2 to carbon nanofibers and nanotubes by molten lithium carbonate electrolysis ("'Diamonds from the sky' approach turns CO2 into carbon nanofibers") that demonstrated that a less expensive natural carbon isotope mix produced the more expensive (carbon nanotube, rather than nanofiber) product, and also that CNTs are formed at high yield in molten carbonate electrolytes (read more: "Transforming greenhouse gas CO2 into carbon nanotubes"). The researchers behind this work, led by Stuart Licht, a professor of chemistry at George Washington University, have termed this high yield, molten carbonate electrolytic transformation of CO2 to CNTs as the C2CNT process. Now, in new work, Licht and his group have advanced this molten carbonate C2CNT methodology to produce a new class of materials – 'carbon nanotube wool'. These are the first carbon nanotubes (CNTs) that can be directly woven into a cloth as they are of macroscopic length (over 1mm) and are cheap to produce. The sole reactant to produce CNT wools is the greenhouse gas carbon dioxide. 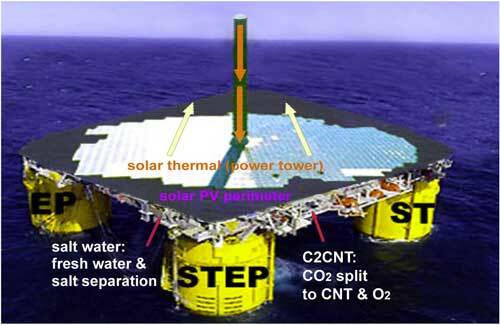 This transforms CO2 from a pollutant into a useful, valuable resource. Reporting their findings in Materials Today Energy ("Carbon nanotube wools made directly from CO2 by molten electrolysis: Value driven pathways to carbon dioxide greenhouse gas mitigation"), the team demonstrates the first macroscopic carbon nanotubes to be produced from carbon dioxide. "Here we delve into the mechanism of formation and find that two or more transition metals can act as growth and repair catalysts in the molten carbonate synthesis," Licht tells Nanowerk. "This facilitates molten carbonate growth of CNTs that are 100 times longer than before." 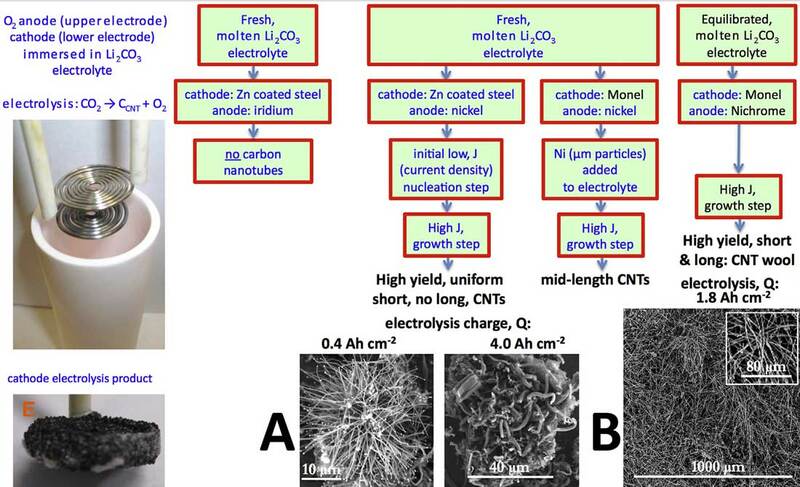 In a separate publication (Data in Brief, "Synthesis, Cost and Scale-ability of Doped, and Wool Carbon Nanotubes Made Directly from CO2 by Molten Electrolysis: Value Driven Pathways to Greenhouse Gas Mitigation", in press), they show that the cost to produce their CNTs is approximately $660 per ton, which compares favorably to the $100,000 to $400,000 current CNT price. Furthermore, they argue that not only is an area equal to 4% of the Sahara Desert sufficient to terraform the CO2 concentration back to pre-industrial levels in ten years, but also that a wind speed of 1 km per hour is sufficient to deliver that CO2 to those STEP (solar thermal electrochemical process (STEP) CNT plants. Due to their strength to mass advantage, inexpensive, weaveable CNT wools could become lightweight replacements for conventional steel and aluminum applications and – in addition to textiles – serve as preferred additives to formulate blast and fracture resistant cement and ceramics. This could lead to inexpensive, lightweight car, train and boat bodies; thin, full-body bullet proof and taser-proof clothing, and fracture and blast resistant ceramics and cements. The team is scaling up their process for a daily transformation of 200 kg of carbon dioxide into CNTs this fall as ongoing participants in the Carbon Prize competition (CarbonXPrize.org, where the team has already reached the semifinal stage) to produce the most valuable product from carbon dioxide in the flue gas of a fossil fuel electric power plant.